When the Army established its OPFOR program in 1976 with Army Regulation 350-2, it defined an OPFOR simply as “an organized force created by and from U.S. Army units to portray a unit of a potential adversary armed force.” Thus, all OPFORs were originally threat-based, in the sense that they replicated the forces, capabilities, and doctrine of a particular country officially recognized as a threat or potential adversary. In the midst of the Cold War, the 1976 regulation identified only one potential adversary against which to train: the Soviet Union. Over time, the Army developed other OPFORs. The Soviet threat was described in great detail in the ’80s with the FM 100-2 series. 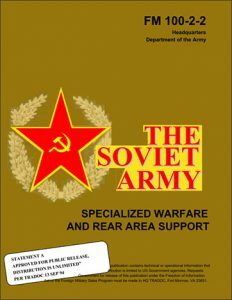 The three-volume set was the definitive source of unclassified information on Soviet ground forces and the Soviet model of combined arms warfare. Used together, the series provided a thorough reference on the Soviet Army. Initiatlly, these publications were distritubution-restricted publications limited to US Government agencies. The series is now out-of-print and largely unavailable. 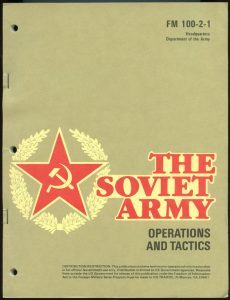 This field manual describes the operations and tactics of Soviet general purpose ground forces. The content is based on information in Soviet writings and other open source literature. Most available information is focused on potential battle in Central Europe. This manual reflects that focus. Though Soviet military activity extends to other parts of the world, the Soviet forces opposite NATO represent a general model for Soviet forces elsewhere, as well as for forces of Soviet allies and surrogates. The term “specialized warfare,” used in the title of this FM, is intended to be an abbreviated, collective description of combat actions which, in US terminology, may be described as “special operations.” or “operations in special conditions.” Special operations include airborne, heliborne,and amphibious operations, and unconventional warfare in the enemy rear. The Soviet concept of the “rear area” visualizes modern war in an unprecedented spatial scope. This rear area concept stretches from the forward edge of the battle area (FEBA) back to the national capital. The Soviet armed forces include five separate components: the strategic rocket forces, the ground forces, the air forces, the air defense forces, and naval forces. The generic term “Soviet Army” normally includes all but naval forces. This manual concentrates on the largest of the these components, the Soviet ground forces. 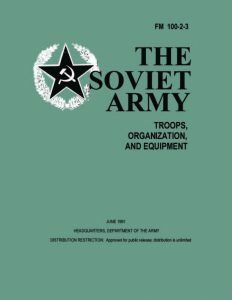 Highly modernized organization and equipment combine to make the Soviet ground forces the most powerful land army in the world, with unprecedented flexibility, mobility, and firepower. In today’s complicated and uncertain world, it is impossible to predict the exact nature of future conflict that might involve U.S. forces. So the military must be ready to meet the challenges of any type of conflict, in all kinds of places, and against all kinds of threats. This is the nature of the contemporary operational environment (COE), and training for such an environment requires a different type of Opposing Force (OPFOR) than that of the past. From the U.S. perspective, an enemy is an individual, group of individuals (organized or not organized), paramilitary or military force, national entity, or national alliance that is in opposition to the United States, its allies, or multinational partners. A potential adversary is sometimes designated as a threat. In this sense, the military defines threat as “any specific foreign nation or organization with intentions and military capabilities that suggest it could become an adversary or challenge the national security interests of the United States or its allies.” Once hostilities actually begin, the threat becomes the enemy. An Opposing Force (OPFOR) is a training tool that should allow U.S. forces to train against a challenging and plausible sparring partner that represents the wide range of possible opponents the military could face in actual conflict. It enables training of all branches of the military and prepares forces for potential combat operations. It has been nearly thirty years since a holistic explanation of the Soviet-based Opposing Force (OPFOR) was examined in the U.S. Army Field Manual 100-2 series. Recognizing this, OPFOR SMARTbook 3: Red Team Army re-examines and outlines the doctrinal operational construct and historical foundations of Soviet-era military forces from the FM 100-2 series, which is now out-of-print and largely unavailable. Second, OPFOR SMARTbook 3 reorganizes that foundational material and aligns it in keeping with contemporary military doctrinal taxonomy to include ADRP 3-0 Unified Land Operations and ADRP 3-90 Offense and Defense (Tactics). Third, OPFOR SMARTbook 3 translates and bridges the strategic- and operational-level doctrine into tactical application at the small-unit level. Through this triangulation, a more modern rendition of Red Team Armies emerges. Download a free PDF sample and learn more at: OPFOR SMARTbook 3 – Red Team Army (Red Team Army: Forces, Operations & Tactics). Topics and chapters include Red Team Army Overview (Military Doctrine, Operational Concept, Personnel & Training, Force Structure, Motorized Rifle Regiment), Offensive Operations (Front & Army Operations, Division and Lower Tactics, Small Unit Tactics), Defensive Operations (Prepared Defense, Hasty Defense, Withdrawal & Relief, Small Unit Tactics), Specialized Warfare (Airborne, Heliborne, Amphibious, Unconventional Warfare), Tactical Enabling Tasks (Reconnaissance, River Crossings, Troop Movement, Relief in Place, Passage of Lines, Checkpoints), Small Unit Drills (Movement & Formations, Dismounted and Mounted Patrols), Urban & Regional Environments (Urban, Mountain, Desert, Cold Wx, and Nighttime Operations), and Rear Area Operations & Logistics.